In the tradition of Unbroken, a dramatic story of American POWs in the Pacific and their incredible escape from a Japanese labor camp. In late 1944, the Allies invaded the Japanese-held Philippines, and soon the end of the Pacific War was within reach. But for the last 150 American prisoners of war still held on the island of Palawan, there would be no salvation. As soldiers, sailors and Marines were herded into shallow air raid shelters, Japanese soldiers doused them with gasoline and set them on fire. By the next morning, only eleven men were left alive-but their desperate journey to freedom had just begun. 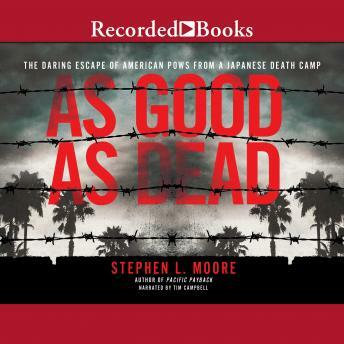 As Good as Dead is one of the greatest escape stories of World War II. Endurance, determination, and courage in the face of death make this a gripping and inspiring saga of survival.